Welcome to P.S. 40 & the P.S. 40 PTA! The P.S. 40 PTA supports the school through a variety of ongoing projects, fund-raisers, and family events. We need and welcome your involvement to make these events happen for our children, whether it is a couple of hours during an evening event, a couple hours a week at the library or chairing an entire event. Being involved in your child’s school is a great way to contribute to their educational experience and have fun! You’ll meet other parents, strengthen our community, and use your talents and resources to maintain the high level or enrichment every P.S. 40 student enjoys. This brochure will give you an idea of the many ways that parents contribute to the well-being of our school. We welcome you to take this time to speak to committee & event chairs as well as Executive Board members and learn more about the school and how you can become involved. You will find contact information for committee and event chairs in this brochure. If you have general questions, need to contact someone, or have skills that you think might be useful for the school community, please contact your PTA Co-Presidents: Dara Cohen at ps40dara@gmail.com and Carla O’Connor at ps40carla@gmail.com. Volunteers are needed immediately to work at our annual Halloween bash, which will be held the evening of Saturday October 21st, We need people to help with set-up, ticket and refreshment sales, activities & games, and our haunted house. It is a fantastic event and we need your help to make it happen! Please contact Florie Huppert at ps40florie@gmail.com or Carla O’Connor at ps40carla@gmail.com. There is 1 Grade Liaison per grade. They serve as important point persons for the Class Parents, and help disseminate information. Grade Liaisons meet virtually as a group. 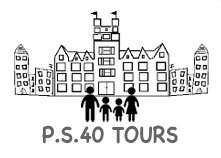 To be a class parent or grade liaison, contact Valerie Merlin at ps40valerie@gmail.com. ps40jenp@gmail.com or Laura Fuller at lmcq123@yahoo.com to volunteer. The Parents as Reading Partners Program (PARP) needs parent volunteers who can make a once a week, half-hour commitment to read to a kindergartner or first grader and share your joy of reading. Please contact Jacqueline Tepper. All students in grades K-5 sing in P.S. 40’s popular music concerts, which also include the 4th and 5th grade band! The concerts feature songs learned under the instruction of our music teacher. Volunteers are needed to assist at rehearsals, set up risers, and to help with the students the night of the performance. Concerts are held in February, March, and May. Please contact Wayne Walter at ps40wayne@gmail.com. Throughout the school year, the PTA holds various daytime bake sales and healthy snack sales. Committee members solicit food donations, sell throughout the day, and assist in set-up and clean-up. Please contact Jen Sabal at ps40jensabal@gmail.com or Laura Fuller at ps40laura@gmail.com. Parents of children in grades K-2 are needed on a regular basis during the year to assist Art teacher Craig Kane in the art studio – handing out materials, washing brushes and helping with set-up and clean-up, both during your child’s class and between classes. No experience necessary! Please contact your Class Parents to volunteer. Partnering with P.S. 40, Barnes & Noble will give a percentage of purchases made by friends and family from Oct. 14-22 to our school. The event kicks off on Sat. October 14 at the Union Square store with a fun P.S. 40 planned, in-store event, and encourages customers to use our school’s code when making purchases. Please contact Steven Bricker at ps40steven@gmail.com to volunteer. Join the crew and be a PS 40 Roadie! Help set up audio and visual equipment for our Concerts and other school events. Training will be provided, no experience necessary. No traveling required! For more information, please contact Greg Rickens at grickens@hotmail.com. Sports Night is one of the most popular family events of the year. It is traditionally held in late January across the street at MS 104 and features fun activities organized by P.S. 40’s Physical Education teacher, Andrew Bieber, and run by teachers, alumni, and staff. There are games, food, and prizes for all the children. Volunteers are needed to decorate, clean-up, sell tickets and refreshments, and run the prize booth. Parents are also needed for the big Parent-Teacher Volleyball game at the end of the evening. A great time for all! Please contact Benjy Kile at ps40benjy@gmail.com to volunteer. To make this event a success, we need as many parents as possible who can draw on their contacts and experience to solicit wonderful auction items. In addition, we need parent volunteers in these areas: Auction Catalog (writing, editing and layout), Event Promotion (flyers, posters, ticket sales, online promotion), Donation Solicitation, Donation Intake and Management, Class Art Projects, Set-up, and Clean-up. Please contact Auction Co-Chairs Jen Oakes, Valerie Merlin, or Hillary Perlman at ps40auction@gmail.com. Do you own a catering company or have access to restaurant food or supplies at cost? We need people who can provide food for our big events like Fright Night and Sports Night, and teacher appreciation meals at Parent-Teacher conferences. Please contact Carla O’Connor at ps40carla@gmail.com. Warm up with us this winter with a P.S. 40-only evening Soulcycle class, followed by drinks at a local bar. A portion of the proceeds go to P.S. 40. To help with this event, please contact Dara Cohen at ps40dara@gmail.com. At P.S. 40, we believe community service is an important and vital part of education. In past years we have held successful Food Drives and Toy Drives. Help us teach the gift of giving. Please contact Carla O’Connor at ps40carla@gmail.com or Steven Bricker at ps40steven@gmail.com. The P.S. 40 Library provides a wide variety of volunteer opportunities, including re-shelving, repairing, covering and processing books. The hours are flexible, no commitment is required, and the library is a beautiful and quiet place to do your part. No experience necessary. Please contact Laura Fuller at ps40laura@gmail.com. This PTA-sponsored program brings published children’s book authors to P.S. 40 for readings and book discussions. Visiting authors to P.S. 40 have included: Peter Brown, author of You Will Be My Friend and The Curious Garden; Dan Yaccarino, author of All the Way to America and Doug Unplugged: and Dan Gutman, author of My Weird School, and other series. Volunteers are needed on the day of each Author Visit to host “Author Brunches” and help coordinate the day. Prior to each event, volunteers help with book ordering and publicity. Please contact Carla O’Connor at ps40carla@gmail.com. Parents of P.S. 40 students in all grades are welcome to join the yearbook committee. Layout designers, editors, copywriters, photographers, and organizers are needed. Please contact Charlene Goggin at charlenegoggin@gmail.com to join this committee and create a yearbook to remember! This annual fundraiser turns our students’ art into beautiful mugs, t-shirts, tiles, mouse pads, and much more. Volunteers are needed in October to collect orders and organize the projects, and then again in early December to distribute the items to families. Contact Jen Sabal at ps40jensabal@gmail.com or Steven Bricker at ps40steven@gmail.com. 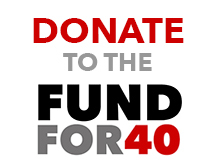 The Fund For 40 helps the PTA raise critical funds for instruction, activities and supplies that enrich the educational experience for our children at P.S. 40. Unlike other school fund-raisers, this annual campaign is a direct outreach to all P.S. 40 families to contribute financially to the school in a way that is most comfortable for each family. Last year we raised more than $140,000 and this year we hope to meet, or surpass that goal. Donations come in all sizes and we are hoping for 100% participation. Our School Store, located in the cafeteria, is where you can buy our beautiful P.S. 40 T-shirts. Volunteers are needed for occasional shifts and especially during events. We are also looking for volunteers to help with pre-sales. Please contact Florie Huppert at ps40florie@gmail.com or Jen Sabal at ps40jensabal@gmail.com. At the beginning of the school year, the PTA plans lower and upper grade potluck dinners for families. They are a great way to meet other parents and to get to know your child’s new friends. Held in the P.S. 40 cafeteria, everyone brings a dish and spends a few hours enjoying good food, good company and fun activities. Volunteers are needed for set-up, serving and clean-up. To help with the Lower Grade Potluck (grades Pre-K, K, 1, 2) on Friday, November 3rd please contact Benjy Kile at ps40benjy@gmail.com or Jackie Fine at jacqueline.fine@gmail.com. For the Upper Grade Potluck (grades 3, 4, 5) on Friday, November 10th please contact Wayne Walters at ps40wayne@gmail.com. The Reading Olympics is a 2-week fundraising event that rewards students for reading books. This year it will be Jan 13-26. It’s a great way to make reading fun while getting our kids to read more! Parent volunteers will help solicit donated prizes, and organize the distribution of student certificates and prizes. Most of the information is given via email, so record keeping can be done at home or work, during the day or evening. Please contact Anne Marie Winter at ps40annemarie@gmail.com. P.S. 40’s School Picture Day is Monday September 18th. Volunteers are needed to organize and deliver order packets, both before and after the event, and to help with children on the day pictures are taken. Please contact Jenn Ryan at jennryan77@gmail.com. Do you have access to a photocopier at work or at home? Can you make specialty items like posters and tickets on card stock? Can you have color posters printed? Please contact Dara Cohen at ps40dara@gmail.com or Tricia Ryan at ps40tricia@gmail.com.